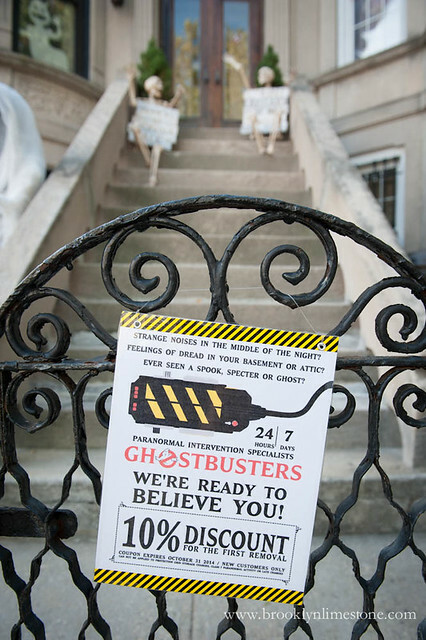 Halloween 2014: Who You Gonna Call? Just a few more weeks to Halloween so time for the hard press. 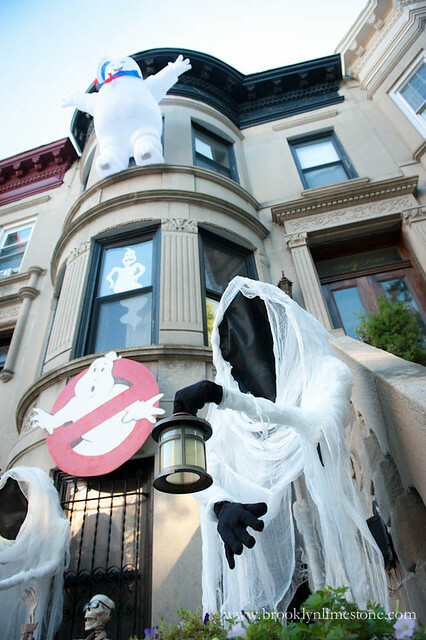 This year's theme is Ghostbusters. 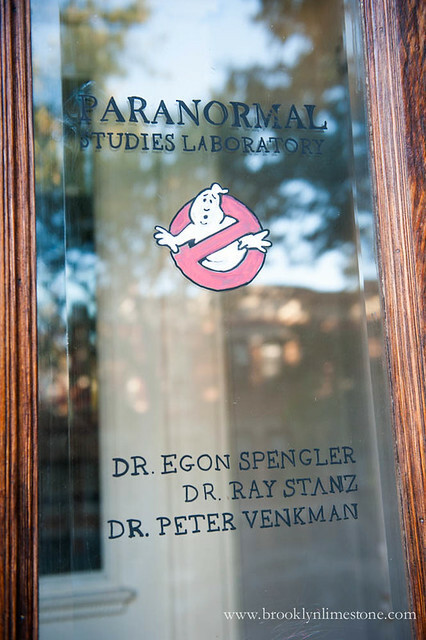 We decided on it earlier this year as a tiny homage to the late, great Harold Ramis. 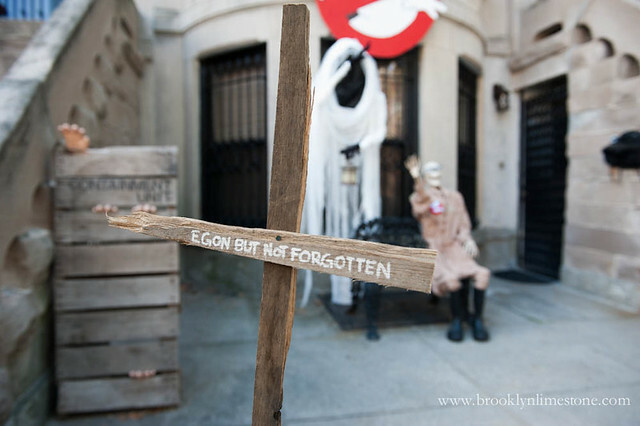 Egon but not forgotten. 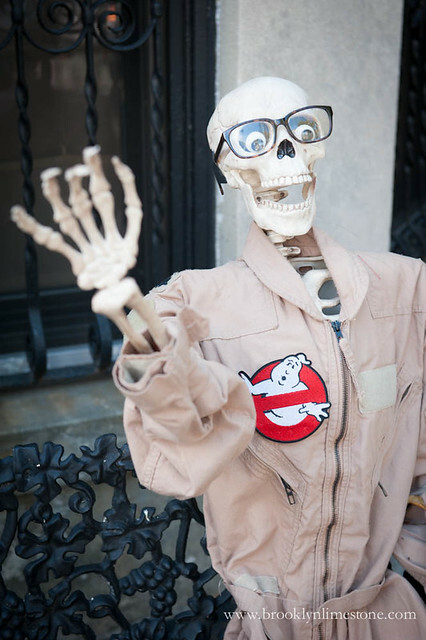 The Stay Puft Marshmallow man was purchased and the skeletons are old favorites. Everything else was created for this year. 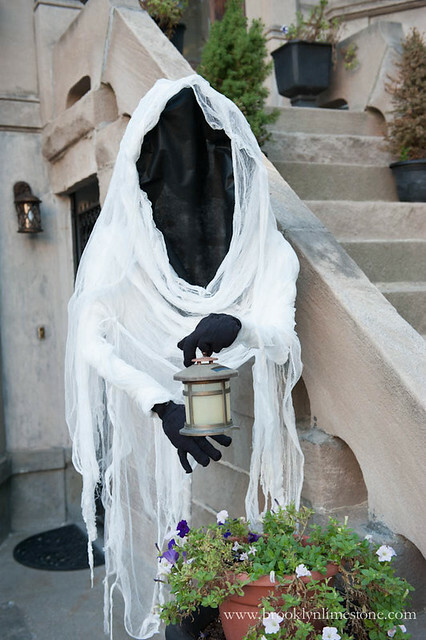 I'm especially loving the hovering specters we made using some pvc pipe, chicken wire and cheese cloth. 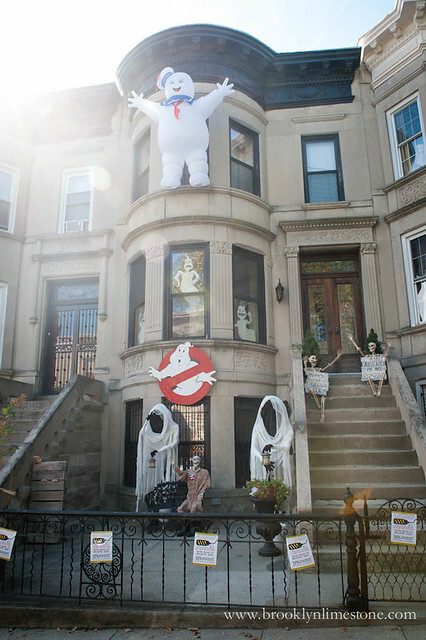 The kids who pass by seem to enjoy it and I'm pleasantly surprised just how many young kids have seen Ghostbusters which is turning 30 years old this year! Note to those parents: You are doing it right! Now its time for party prep! Amazing!!!! I get excited every year to see how you decorate for Halloween. Had a sign stolen one year from our display even though it was wired on. Bummer. Seriously you never ever disappoint at Halloween!! Love this so much!!! So fun! This is so good!! I love the skeletons on the steps. 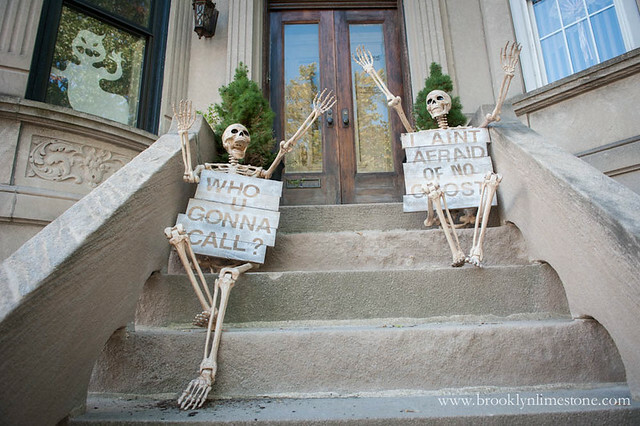 I bet they are going to scare a few trick-or-treaters. Love the wooden signs. LOVE the door with the names on it. This is AWESOME!!! oh I love it! Another great one! You are so awesome for this - well, I guess, just even more awesome than before! Love it! That is so awesome. I love all the signage. Now I have Ray Parker Jr. running through my head! I look forward to this post every year!! I love it!! Especially the painted glass door! You are seriously SO GREAT! OMW, this is so cute! I have been checking daily for this. Love the door and the giant ghost sign. I want! Awesome! I just made it out of plywood. It wouldn't be too difficult to recreate. Seems more valuable if you made it. :) It would be a famous sign! Looks Great! Previous years are great too. LOVE LOVE LOVE LOVE LOVE!!!!!!!!!!!!!!!! You are so incredibly creative!!! love it! great job as always!! This is my third time trying to publish this so I am praying that the other two haven't gone through so I don't look like a crazy person. Soooo awesome! As usual! You never disappoint. I love the Ghostbusters and everytime I watch it I find new hilarious parts. LOVE! This is so fun...simplt amazing!! Yay! I am so excited to see this years Halloween decorations! This is perfect for all ages. My son has already gotten on me because I haven't even started decorating. You definitely got me into the Halloween spirit. You are the Queen of Halloween! Another exciting display. Seriously impressive! I love the Stay Puft Marshmallow Man! 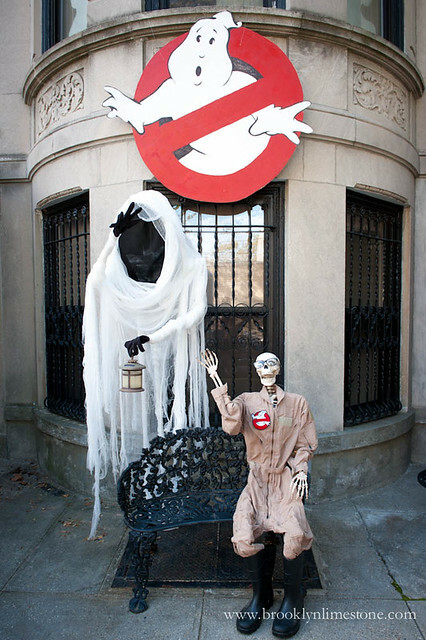 Fond memories of seeing Ghost Busters at the Drive-In movie theater in my home-town. And you're telling me that was 30 years ago - amazing! Love the homage to the movie. Carnival and Insane asylum are still my favorites, but probably best to go a little lighter with the little one around. Look forward to your Halloween post every year, and still have the party deets to look forward to. Thanks for always being inspiring!!! Once again you did not disappoint. Looks spookalicious, love it. Epic as always, S!! 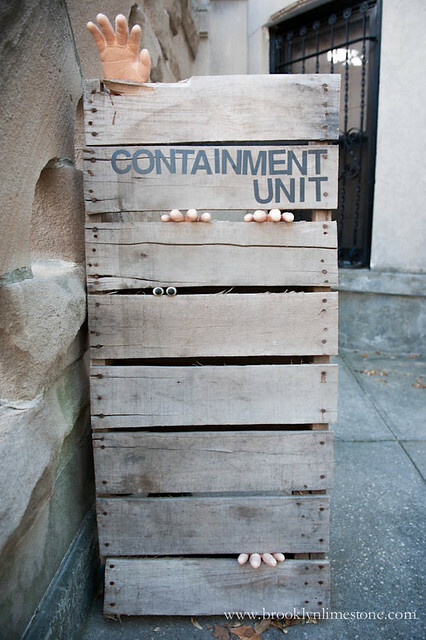 Omg that Containment Unit!! Once again blown away and totally speechless! So cool! Bowing down to the Queen of Halloween! You never disappoint, this is awesome!! Love it!! 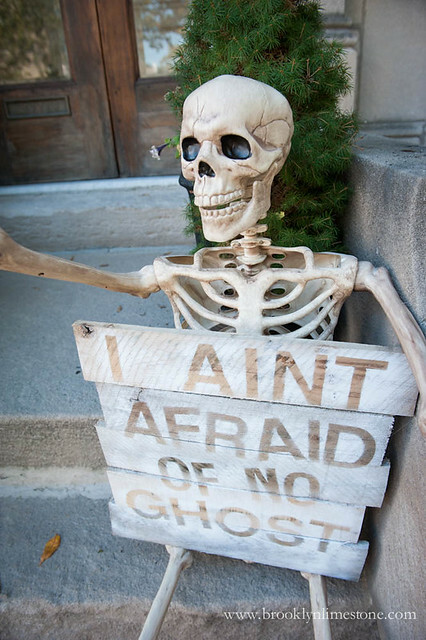 I always like to visit your blog to see your brilliant Halloween decor. You nail it every time!! So creative! Hey there! 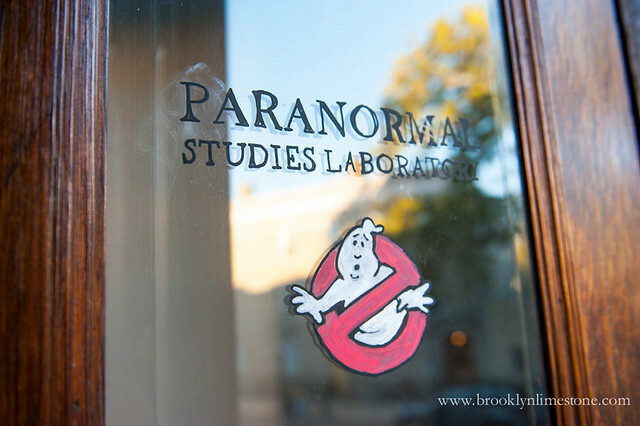 Just stumbled on this post while trying to plan my Ghostbusters Halloween party this year.  We have a round bay window just like yours! 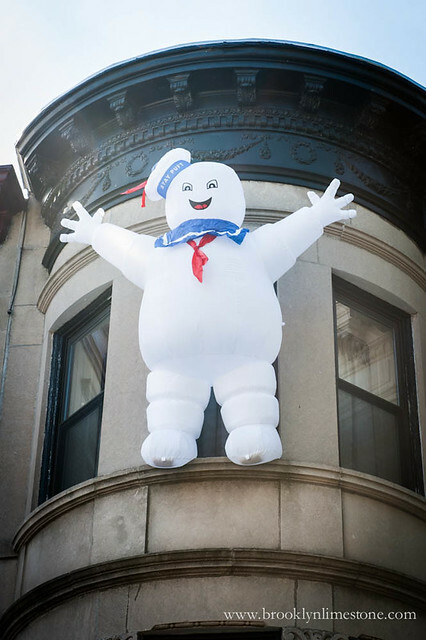 How did you attach your inflatable Puft man to the window? Thanks for the tips!